UPDATED HP has apparently given their partners notice to liquidate everything - 16GB Touchpads will go for $99, and 32GB go for $149 according to Pre Central. Sale starts tomorrow apparently, I will go get some 16GBs myself, 3? 4? 5? Not sure yet.. Even if you use it for nothing other than web browsing (or watching video) it's a nice device. Pair it with a Touchstone (I love the Touchstone technology) and you got yourself a high resolution picture frame that can do far more for about the same cost as a 1024x768 standalone frame. I assume the accessories for the Touchpad will be dirt cheap as well. Beats the hell out of a fire sale Android tablet I saw on Daily Steals recently. Apparently some users in Europe received the Pre3 already, so they have manufactured some, hopefully I can get my hands on a couple. UPDATE - I visited about a dozen stores in the bay area none of them had any Touchpads in stock this morning. Best Buy is refusing to participate in the fire sale and I think supply is generally constrained. I suspect mostly what is happening is most stores probably have single digit numbers of Touchpads in stock, I'd be surprised if in many cases employees weren't buying some of those right away, then all it takes is one or two customers to consume the remainder of the stock. More than one place I went to today had others like me racing around the area trying to find stock. Thought it was kind of funny, one of the office supply stores - forgot which - had little advertisements with the reduced pricing (though for them it was $129 for the 16GB), and said good from now till the end of the year while supplies last - only the supplies didn't even last through the first morning. I read many similar stories on Pre Central in other parts of the country. 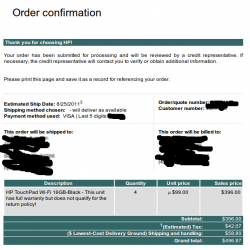 Then I saw a link mentioning the HP SMB store had Touchpads available for order (the "Home" store lists them as out of stock). I'll save you the next 100 lines of that, and just say I was pretty persistant, working for more than two hours to try to get an order through. Not long after I started I found that Firefox and Seamonkey which I normally use in Linux was not rendering the billing address page on HP's site, I suspect the page was somehow broken because HP's servers are in a hissy fit at the moment. So I tried Opera - fortunately Opera was able to render the page. After trying again and again and again and.. I finally got an order confirmed for 4 x 16GB Touchpads for $99/ea. I hope HP honors it, I suspect they will have enough to ship given the massive numbers of units they will be receiving from Best buy (apparently something like 250,000 units). Though earlier today I was really thinking to myself it really would of been nice if HP had given preferential treatment to those early adopters, give them the opportunity to buy more before the rest of the public. I suppose there wasn't any time, and possibly wasn't anyone around that cared enough to try to arrange something like that. I just hate the idea that small numbers of people may be able to buy large numbers of touchpads (I saw one report of a person buying 35 of them at once), and trying to profit off of it on eBay (reminds me of a lady that mortgaged her home and tried to buy every iPhone at a store one day only to be told she was only allowed to buy one). For me I will use one of the four for work use only, at least two more will likely be gifts for family I think they will like them a lot, and the 4th I haven't figured out yet, probably a spare unit or something, since HP apparently is not going to honor warranties on these units (though I believe they are honoring them on the ones sold at full price). Since I was in such a rush to order - I'm contemplating trying to go through the process again to get a 32GB touchpad - so I can return it to best buy for $599 (what I paid for my current TP). I thought about just returning my current one but migrating the data and stuff would be a pain - and I know my current TP works great - there's always a chance that a replacement might have a glitch. Best buy extended the return period for Touchpad to 60 days, which gives me about 11 days if I wanted to return mine. HP is certainly not going to die any time soon, but it seems that a large number of people(some of which are investors) did not like what they heard from HP yesterday sending their stock down about 21% to levels not seen in what seems more than five years. Myself I don't agree with their strategy either in trying to get rid of their PC business as well as kill WebOS - a market that is growing faster than anything else right now and most people seem to think is the future (mobile computing stuff). Speaking of mobile, I was surprised last year when looking at their site that the iPAQ was still around - I recall that as being a popular device about a decade ago though haven't heard the brand mentioned in many years. 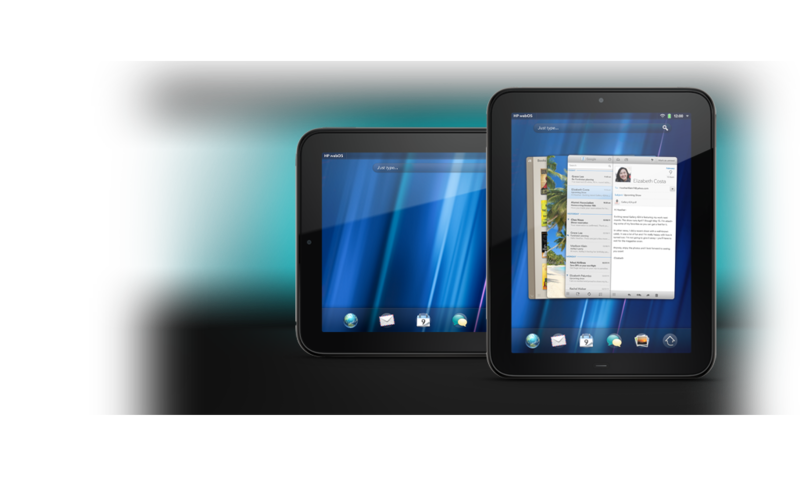 I wonder if HP will keep that stuff around or kill it with WebOS. Then there is the acquisition of this Atonomy software company for $10B, never heard of the company myself, looked briefly at their web site and am not familiar with the space. I saw, or read yesterday that Atonomy is on track for $1B in revenues this year. I'd of course prefer HP invest $10B in WebOS that would be a much better strategy in, as previously mentioned, a much faster growing market. It is nice to see investors punishing the stock today, after writing about WebOS yesterday I saw that HP had indeed replaced roughly half of it's board members as well as the CEO since the acquisition of Palm last year. Another interesting flip flop that the CEO of HP did is indeed on the consumer products, saw earlier on CNBC this morning one of the anchors of the show dug up a quote from earlier this year where the current CEO of HP said the consumer unit of the company gave HP "an immense competitive advantage" (his exact words). Now, barely six months later they can't wait to get rid of it. I know really nothing about their consumer PC stuff - I wouldn't ever buy one of their laptops (prefer Toshiba now that IBM Thinkpads are gone), desktops are pretty generic no matter where you go, printers..whatever. PCs aren't going away any time soon. Unfortunately - it seems like in general more signs of short term thinking a problem that plagues both our public an private sectors, and only seems to be getting worse as time goes on. HP's previous CEO was known for gutting the company of R&D and cutting costs..